This article is part of a five-article series, inspired by my trip to the Mt. Everest Base Camp. This episode discusses one of my favourite things about hiking: the fact that we give up many things we take for granted, and return to them a more grateful person. …until it’s gone, so the saying goes. This is precisely one of my favourite things about roughing it out in the wild – I learn to appreciate the many, many things that make modern life a pretty enjoyable experience. The Mt. Everest Base Camp hike would be my longest trek to date. Twelve straight hiking days mean nearly two weeks of giving up a LOT of comforts and luxuries. 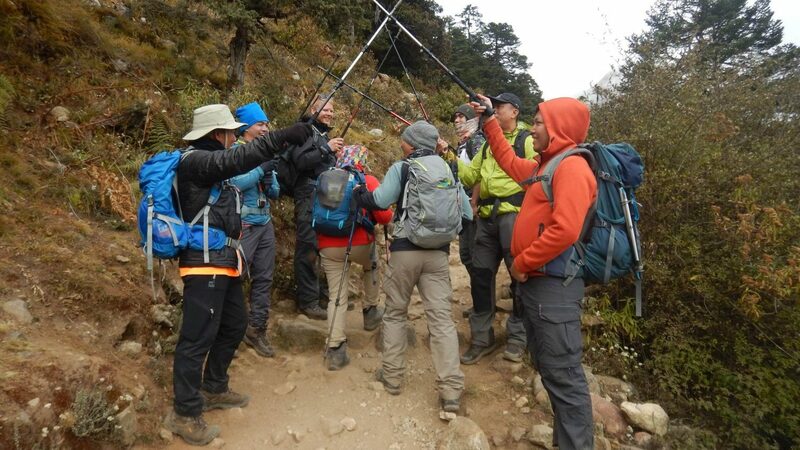 In addition, we had a strict gear weight limit to follow: no more than 15kg of total gear per person. You know what this means. There will be less clothes, less snacks, and less equipment. The things that make multi-day hikes relatively comfortable would have to be sacrificed in the interest of going light and being efficient with the gear that we do have. Personally, I didn’t really give up that much since I’m a light packer to begin with. The first few days were very much tolerable. I didn’t find myself missing a hot shower (it would be dangerous to shower in the cold temperatures, in any case), or an Internet connection (signal was spotty along most of the trail, plus it was obscenely expensive). But there were days when I did miss the little things that I took for granted in the city. One was drinking water. It was a bit unsafe for us to drink from the mountain streams, as water sanitation (except for boiling) is virtually nonexistent in these spots past 4000 meters above sea level. Even boiled water was full of sediment and mysterious floating objects. The safe (and smart) thing to do would be to drink bottled water. But bottled water weighs a lot, and everything is carried on the backs of people or animals in this part of the world. A premium is, as expected, paid for this mode of transportation. The price of bottled water would triple by the time one hits Day 7 or 8, and would not get cheaper for the next few days. I missed free water, for sure. Then there are items such as toilet paper and wet wipes, which would inevitably run out. As you can probably guess, the cost of these things at this altitude was simply ridiculous. A pack of ten-pull tissues cost me about $5. Desperate times and desperate measures, eh? Deprivation is a good thing. Once I returned to the city, I had a newfound joy when I used or experienced again the many little things that I had to seriously think about while on the mountain. I no longer had to debate about using (expensive) drinking water for brushing my teeth; water was free again! And potable! And boy did I miss free Wi-Fi. Yes, we take a lot of things for granted, and perhaps this isn’t something we can control. We live in a world full of comforts and luxuries, and it isn’t our fault that we get used to them. Maybe for us to be appreciative again, to be grateful again, we need to deprive ourselves – even a little bit. We live such hurried lives, that we go through our days and through ‘the little things’ with barely a thought, that is until we miss them and would do anything to have or experience them again. So go ahead and take your sweet time in the shower. Go ahead and sip your coffee slowly. Slowly. Go ahead and stay in bed for another 5 minutes. Go ahead and read another page of that book. You’ll want to do these, right about when you can’t. So do them when you can. Featured image: Members of Trail Adventours’ Team Coby having some fun by making a ‘crossed swords’ path for Team Guido’s Benedict and Eirene (who have been married 20+ years and are now bonding through hikes).